Distribution of news on the New York times. One of the databases used for this research. 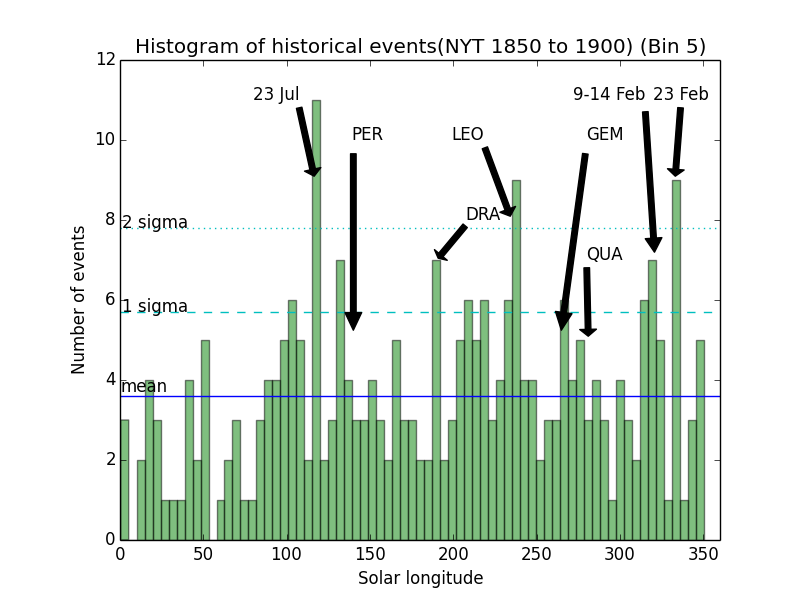 Dates correspond to the position of the sun on 2013. · Analysis of the appearance frequency of these superbolides and big fireballs (meteors brighter than the Full Moon) shows how some dates have a greater abundance, as it does with meteor showers (much smaller meteoroids). This is direct evidence on the existence of small asteroids yet to be discovered, that cross Earth’s orbit and may impact it. · Researchers and students of Universidad Complutense de Madrid started a citizen science project delving into national and international newspapers archives like New York Times and El País. · The preliminary results were presented in the XXI National Astronomy Conference hold in Granada, Spain in May 2014 (http://goo.gl/Ngwshw). Madrid, 16th December 2014. A research team of the Astrophysics and Atmospheric Sciences Department of the Universidad Complutense de Madrid, in collaboration with Physics degree students, have elaborated a catalog of big fireballs appeared in newspapers in the last 200 years. The data gathered show that some dates have a greater abundance of these events. Preliminary results were presented in the XXI National Astronomy Conference hold in Granada, Spain in May 2014 . Digitalization of newspapers archives has made available to researchers a vast quantity of historical information about truly rare events like superbolides (very energetic phenomena, in the kilotons range, some of them as brilliant as the one observed in Chelyabinsk, Russia on February 2013). This citizen science project is part of Research Initiation program for Physics students and amateur astronomers of the University Astronomical Club (ASAAF, in Spanish). This study confirms that superbolides are uncommon, but some of them have clear sources as they come from streams of small bodies in the centimeter-meter range. While these objects are not hazardous for us, as they are burnt almost completely in the atmosphere, it complements the study of bigger bodies that are rarer and difficult to discover (not bright/big enough to be found by ground-based telescopes). Among these dates with overabundance of superbolides, the 12th-13th February outstands. It indicates that Chelyabinsk may have been member of family of large meteoroids. The 21st-23rd (current epoch) July is another highlighted date, with some well known fireballs related: the 20th July 1860 Great Meteor seen across the United States, or the ‘Pennsylvania’ fireball event that dazzled Americans the 23rd July 2001. Currently the students are completing the database with other source from the 17th, 18th, 19th, 20th and 21st century, comparing the results with other methods and techniques to yield a scientific publication, as the final goal of the research introduction initiative.